One of the great wonders of the known world the patriarchal basilica of the Holy Wisdom of God is the largest cathedral in the known world at this time. 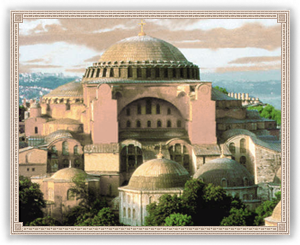 It has stood since the 6th century when Emperor Justinian I first ordered its construction and is the center of the Orthodox religion, holding many holy relics. Having such a wonderous building as the center of worship makes the people of the city proud and content.